I'm looking for a way to typeset Carnatic (Indian) music. The notation system is textual, similar to solfa, with some symbols like comma, semi-colon and | for durations, and bar lines. Fine control for notes, phrases, and spacing between is needed. Control over Vertical alignment is needed too. 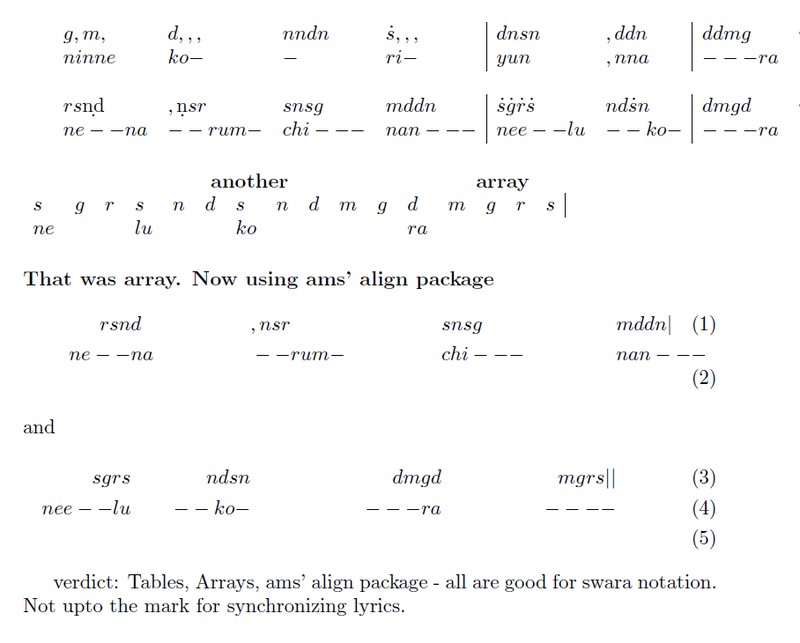 verdict: Tables, Arrays, ams' align package - all  are good for swara notation. Not upto the mark for synchronizing lyrics. Grid like, fixed spacing between notes is possible - Tables etc., and are widely used too. I'm looking for flexible spacing between musical phrases, and points of alignment between lines. Inspired by Lilypond, one could say. Is it possible to do these with LaTeX? If so, how? I've tried using arrays and align (ams) with not so satisfactory results. I have to experience in this type of music. But it seems that you want some fancy align/verbantim stuff to typeset it. Ideally a new package needs to be designed for this. I seems that ConTeXt with Auctex and table editing mode can greatly simplify such typesetting for you. Not the answer you're looking for? Browse other questions tagged music vertical-alignment spacing or ask your own question. 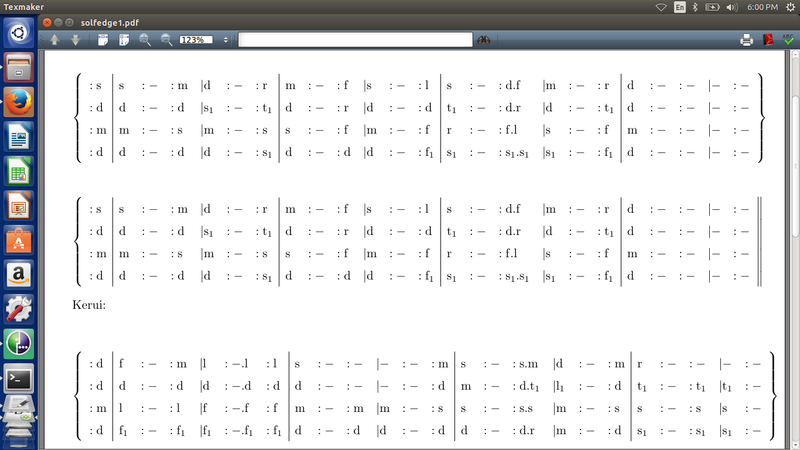 Is there any package in latex for typing song in solfa notation? Can I create music sheets with LaTeX? How to write the music symbols in TeX? Can I add music/rythm notations in text? How to change \footnote notation locally to music symbols/notes?